This salad is super easy to prepare and extremely satisfying to eat. Feel free to experiment with using different kinds of vegetables and beans and alter the proportions to your taste. Just be sure to keep the ratio of dressing to salad the same for the most delectable mix. 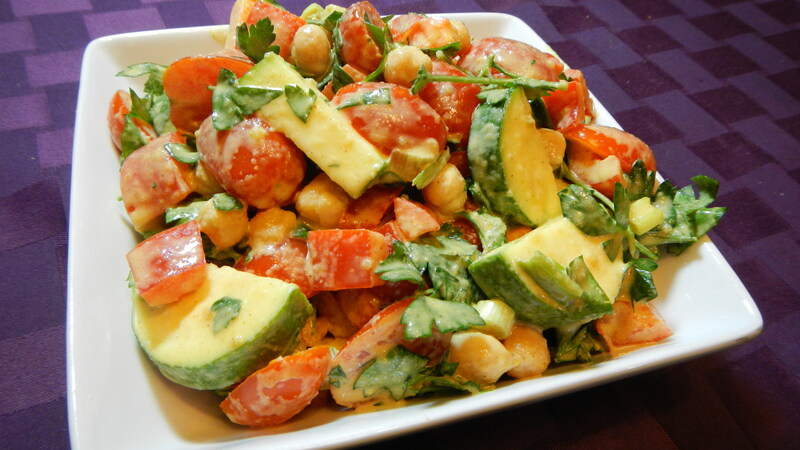 Put the zucchini, bell pepper, scallions, tomatoes, parsley, and chickpeas in a large bowl and gently mix. Combine the tahini, brown rice syrup, lemon juice, garlic, soy sauce, ground turmeric, salt, cayenne, and water in a small bowl or large measuring cup. Whisk until smooth. Add additional water to reach the desired consistency. Stir the dressing into the salad until the vegetables and beans are evenly coated. Chill for a few hours before serving.